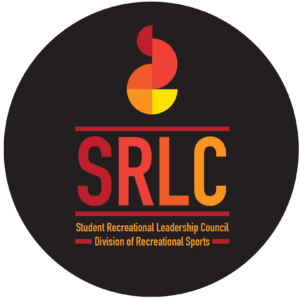 The Student Recreational Leadership Council (SRLC) is meant to provide various opportunities that ultimately improve the experience for student staff members at Rec Sports. Students currently employed with the Division of Recreational Sports have applied and been selected to represent the department they work for within the Division. This group collectively represents the student staff population and takes initiatives that allow for all student staff members to become more involved and enjoy their time with Rec Sports. The council consists of 15 members spread across the five departments within the Division: Aquatics, Competitive Sports, Fitness/Wellness, Marketing, and Member Services & Operations. Two professional staff members, along with multiple interns, are involved with the SRLC to facilitate and oversee the Council. The SRLC encourages attendance at conferences and events for exposure to networking opportunities, leadership training, and development and application of transferable skills. As a way to make these opportunities more appealing as well as financially feasible for students, the Council offers reimbursement for students who attend conferences focused on professional development. A new initiative in 2016, the SRLC provides opportunities to benefit UW-Madison and the greater Madison area community. These opportunities may include volunteering at local races and athletic events, or participating in food drives throughout the year. In providing staff members with ways to impact the local community, the Council has introduced a new aspect of being a staff member at Rec Sports. Additionally, any money raised through volunteering is put towards reimbursement requests and various SRLC impact efforts. See our Upcoming Events page for ways to get involved. The Council takes suggestions from staff members to improve the Rec Sports experience. Since the birth of the Student Recreational Leadership Council, we have implemented an increased student wage structure, received constructive feedback on the Master Plan, and put on a Student Employee Banquet to give back to our staff for all the work they put in. Let us hear your thoughts. If you have any questions, feel free to email srlc.chair@gmail.com. If you need service hours for a greek organization, other RSO, etc., this can count! Are you a current Rec Sports student employee looking to get more involved? Sounds like you’d be a good fit for the SRLC! We are now accepting applications for new council members. Questions about the SRLC? Want to know more? Email us at srlc.chair@gmail.com.